With Aromatherapy Essential Oils of Kunzea, Fragonia, Eucalyptus and Frankincense. 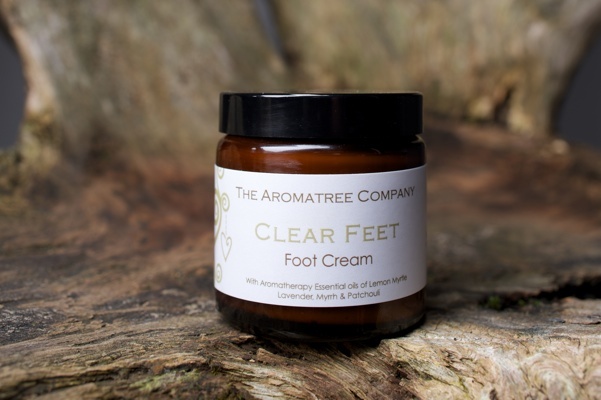 A rich, nourishing foot cream which is a tonic for the mind and emotions, gently supporting, balancing and unblocking the emotions, bringing peace and calm within, allowing you to move on in life. Not suitable for pregnancy. Aqua (water), Butyrospermum parkii (Shea Butter Oil), Prunus amygdalus (Organic Cold Pressed Sweet Almond Oil), Urea (Carbamide), Sodium stearoyl lactylate (Vegetable Emulsfier), Glycerol stearate (Vegetable Emulsifier),Carthamus tinctorius (Organic Thistle Oil), Cetyl Alcohol (from Palm Oil), Theobroma Cacao (Organic Cocoa Butter), Phenoxyethanol and Ethylhexylglycerin (Preservative), Tocopherol acetate (natural Vitamin E), Glycine Soya Oil, Helianthuus Annuus Seed Oil, Kunzea Ambigua (Kunzea Essential Oil),Agonis Fragrans (Fragonia Essential Oil), Eucalyptus Stageriana (Essential oil), Boswellia sp. (Organic Frankincense Essential Oil), Limonene*. With aromatherapy Essential Oils of Lavender, Lemon Scented Tea Tree, Juniper Berry, Peppermint and Rosemary. An easily absorbed moisturising foot cream to help revive tired, achey or swollen feet. When massaged into the feet can have a cleansing, tonic effect and help stimulate circulation. Not suitable for pregnancy, high blood pressure or epilepsy. Aqua (water), Olea europea (Organic Olive Oil), Prunus amygdalus (Organic Cold Pressed Sweet Almond Oil), Urea (Carbamide), Sodium stearoyl lactylate (Vegetable Emulsfier), Glycerol stearate (Vegetable Emulsifier),Carthamus tinctorius (Organic Thistle Oil), Cetyl Alcohol (from Palm Oil), Theobroma Cacao (Organic Cocoa Butter), Phenoxyethanol and Ethylhexylglycerin (Preservative), Tocopherol acetate (natural Vitamin E), Glycine Soya Oil, Helianthuus Annuus Seed Oil, Lavandula angustiolia (Organic Lavender Essential Oil), Leptosperum petersonii (Organic Lemon Scented Tea Tree Essential Oil), Juniperus communis (Organic Juniper Berry Essential Oil), Mentha piperita (Organic Peppermint Essential Oil), Rosmarinus officinalis (Organic Rosemary Cineol Type Essential Oil), Geraniol*, Limonene*, Linalool*. With Aromatherapy Essential Oils of Patchouli, Benzoin, Geranium and Myrrh. 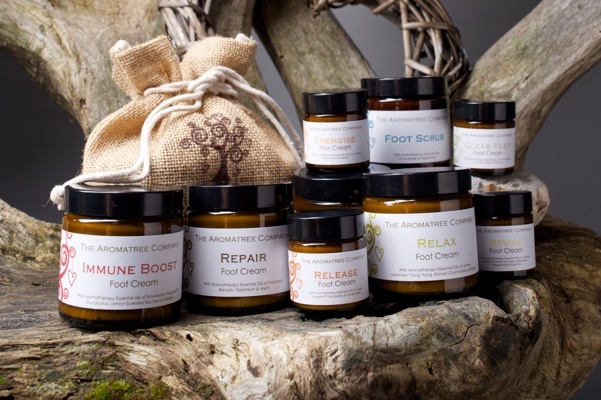 A rich, nourishing foot cream made from butters and oils excellent for skin conditioning. 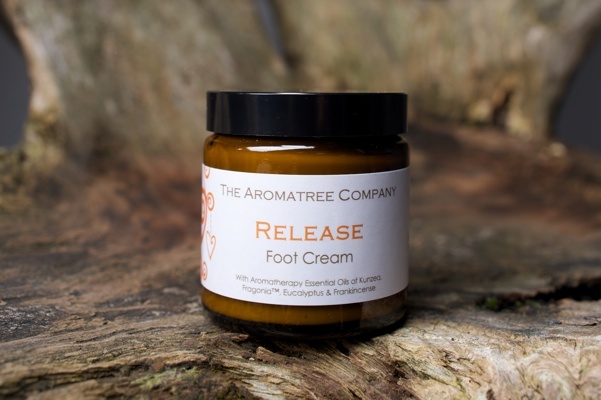 With Essential oils known for their healing, regenerating and rejuvenating properties, helping to heal, soften and protect feet and heels from sores, cracks and dryness. Not suitable for pregnancy. Aqua (water), Butyrospermum parkii (Shea Butter Oil), Prunus amygdalus (Organic Cold Pressed Sweet Almond Oil), Urea (Carbamide), Sodium stearoyl lactylate (Vegetable Emulsfier), Glycerol stearate (Vegetable Emulsifier),Carthamus tinctorius (Organic Thistle Oil), Cetyl Alcohol (from Palm Oil), Theobroma Cacao (Organic Cocoa Butter), Phenoxyethanol and Ethylhexylglycerin (Preservative), Tocopherol acetate (natural Vitamin E), Glycine Soya Oil, Helianthuus Annuus Seed Oil, Pogostemon patchouli (Organic Patchouli Essential Oil), Styrax tonkinensis (Benzoin Essential), Pelargonium graveolens (Organic Rose Geranium Essential Oil), Commiphora Myrrha (Myrrh Essential Oil), Benzyl Cinnamate*, Citral*, Citronellol*, Geraniol*, Limonene*, Linalool*. With Aromatherapy Essential Oils of Lemon, Lavender, Ylang Ylang, Roman Chamomile and Vetivert. A rich, nourishing foot cream to help calm, comfort and soothe, restoring balance and harmony within. Helps ease worry, nervous tension, sleep problems and is deeply relaxing and grounding. Aqua (water), Butyrospermum parkii (Shea Butter Oil), Prunus amygdalus (Organic Cold Pressed Sweet Almond Oil), Urea (Carbamide), Sodium stearoyl lactylate (Vegetable Emulsfier), Glycerol stearate (Vegetable Emulsifier),Carthamus tinctorius (Organic Thistle Oil), Cetyl Alcohol (from Palm Oil), Theobroma Cacao (Organic Cocoa Butter), Phenoxyethanol and Ethylhexylglycerin (Preservative), Citrus limonum (Organic Essential Oil), Lavendula angustifolia (Organic Lavender Essential Oil), Tocopherol acetate (natural Vitamin E), Glycine Soya Oil, Helianthuus Annuus Seed Oil, Cananga odorata genuina (Organic Ylang Ylang Essential oil, Chamaemelum noble (Organic Roman Chamomile), Vetiveria Zizanoides (Organic Vetivert Essential Oil), Benzyl Benzoate*, Benzyl Benzoate*, Benzyl salicylate*, Citral*, Farnesol*, Geraniol*, Limonene*, Linalool*. With Aromatherapy Essential oils of Lemon Grass, Rosemary and Eucalyptus. An easily absorbed moisturising foot cream to revive, stimulate and energise you in the morning or a “pick me up” to help you get through the day and overcome fatigue. 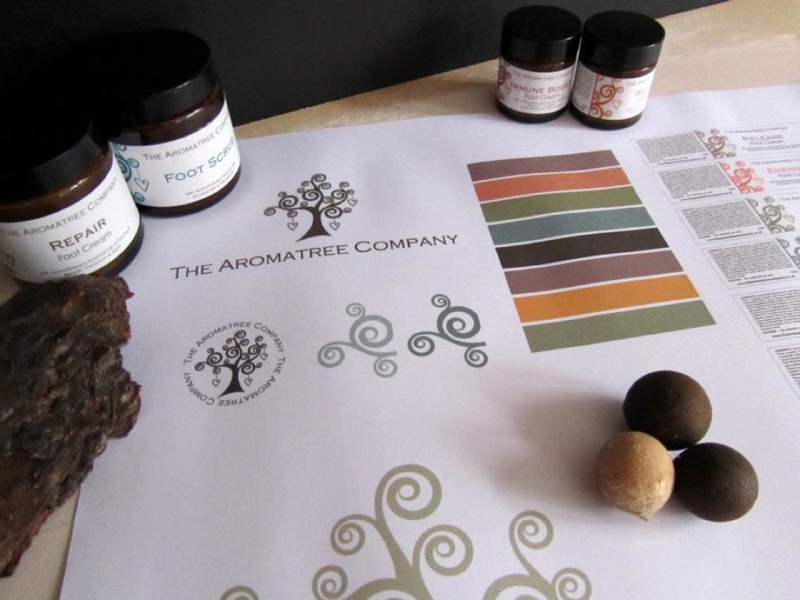 With Essential Oils to assist in clear thinking, concentration and uplifting the spirit. Not suitable for pregnancy, high blood pressure or epilepsy. Aqua (water), Olea europea (Organic Olive Oil), Prunus amygdalus (Organic Cold Pressed Sweet Almond Oil), Urea (Carbamide), Sodium stearoyl lactylate (Vegetable Emulsfier), Glycerol stearate (Vegetable Emulsifier),Carthamus tinctorius (Organic Thistle Oil), Cetyl Alcohol (from Palm Oil), Theobroma Cacao (Organic Cocoa Butter), Phenoxyethanol and Ethylhexylglycerin (Preservative), Cymbopogon citratus (Organic Lemon Grass Essential Oil), Eucalyptus Radiata (Essential Oil), Tocopherol acetate (natural Vitamin E), Glycine Soya Oil, Helianthuus Annuus Seed Oil, Rosmarinus officinalis (Organic Rosemary Cineol Type Essential Oil), Citral*, Eugenol*, Geraniol*, Citronellol*, Limonene*, Linalool*. With Aromatherapy Essential oils of Ravensara, Fragonia, Eucalyptus, Lemon scented Tea Tree and Vetivert. An easily absorbed moisturising foot cream with a blend of essential oils known to stimulate and support the immune system especially when stress and over work are depleting the body’s natural defences.Not suitable for pregnancy. Aqua (water), Olea europa (Organic Olive Oil), Prunus amygdalus (Organic Cold Pressed Sweet Almond Oil), Urea (Carbamide), Sodium stearoyl lactylate (Vegetable Emulsfier), Glycerol stearate (Vegetable Emulsifier),Carthamus tinctorius (Organic Thistle Oil), Cetyl Alcohol (from Palm Oil), Theobroma Cacao (Organic Cocoa Butter), Phenoxyethanol and Ethylhexylglycerin (Preservative), Tocopherol acetate (natural Vitamin E), Glycine Soya Oil, Helianthuus Annuus Seed Oil, Ravensara aromatica (Ravensara Essential Oil), Agonis fragrans (Fragonia Essential Oil), Eucalyptus radiata (Essential oil), Leptosperum petersonii (Organic Lemon Scented Tea Tree Essential Oil), Vetiveria zizanoides (Organic Vetivert Essential Oil), Limonene*, Linalool*. With aromatherapy essential oils of Lemon Myrtle, Lavender, Myrrh and Patchouli. An easily absorbed moisturising foot cream with an Essential Oils known for their antimicrobial and anti fungal properties. Not suitable for pregnancy. Aqua (water), Olea europea (Organic Olive Oil), Prunus amygdalus (Organic Cold Pressed Sweet Almond Oil), Urea (Carbamide), Sodium stearoyl lactylate (Vegetable Emulsfier), Glycerol stearate (Vegetable Emulsifier),Carthamus tinctorius (Organic Thistle Oil), Cetyl Alcohol (from Palm Oil), Theobroma Cacao (Organic Cocoa Butter), Phenoxyethanol and Ethylhexylglycerin (Preservative), Tocopherol acetate (natural Vitamin E), Glycine Soya Oil, Helianthuus Annuus Seed Oil, Backhousia citriodora (Lemon Myrtle Essential Oil), Lavandula angustifolia (Organic Lavender Essential Oil), Commiphora Myrrha (Myrrh Essential Oil), Pogostemon patchouli (Organic Patchouli Essential Oil), Eugenol*, Geraniol*, Limonene*, Linalool*. A rich, nourishing cream scrub to moisturise and soften, with Apricot Kernal Seeds to gently exfoliate dead skin cells to leave feet soft and smooth. Not suitable for pregnancy. Aqua (water), Apricot Seed Powder (Apricot Kernal), Butyrospermum parkii (Shea Butter Oil), Prunus amygdalus (Organic Cold Pressed Sweet Almond Oil), Urea (Carbamide), Sodium stearoyl lactylate (Vegetable Emulsfier), Glycerol stearate (Vegetable Emulsifier), Carthamus tinctorius (Organic Thistle Oil), Cetyl Alcohol (from Palm Oil), Theobroma Cacao (Organic Cocoa Butter), Mentha piperita (Organic Essential Oil), Lavandula angustiolia, Phenoxyethanol and Ethylhexylglycerin (Preservative), Tocopherol acetate (natural Vitamin E), Glycine Soya Oil, Helianthuus Annuus Seed Oil, Geraniol*, Limonene*, Linalool*. Here is a lovely way to see the full range in one glorious collage. With Aromatherapy Essential Oils of Patchouli, Benzoin, Geranium and Myrrh. With aromatherapy Essential Oils of Lavender, Lemon Scented Tea Tree, Juniper Berry, Peppermint and Rosemary. With aromatherapy essential oils of Lemon Myrtle, Lavender, Myrrh and Patchouli. With Aromatherapy Essential oils of Ravensara, Fragonia, Eucalyptus, Lemon scented Tea Tree and Vetivert. With Aromatherapy Essential oils of Lemon Grass, Rosemary and Eucalyptus.